On April 23 at 7:00 am a small group of people met at the top of a hill in rural southwest Wisconsin. For the next 24 hours, they took turns speaking the words of one of the most prolific and influential writers in human history. Lines from William Shakepeare’s As You Like It and dozens of other plays and sonnets rang out across the hillside during the Vigil in the Woods at American Players Theatre. Paying tribute to playwright and poet William Shakespeare, members of school and community theaters, professional and amateur actors, and lovers of great literature took to the open-air stage to share their passion for what many consider to be the greatest collection of words in the English language. Experience wasn’t necessary to participate, and polished performance wasn’t the point. In the hearts and on the tongues of those present at the Vigil in the Woods that day, Shakespeare’s words were enough. Four hundred years after his death at age 52, people all over the world are honoring the Bard through performance and discussion of his work. As a testament to the lasting power of his wit, wisdom, and wordcraft, Shakespeare is today performed in every language, under every condition, from prestigious performance halls to refugee camps, across the world. In the opening decades of the 1600s you could see a Shakespeare play only at the open-air Globe Theatre in London, England. Located just south of the River Thames, the Globe was home to the King’s Men, Shakespeare’s company of actors, and was the practicing ground for honing his craft. Shakespeare and his fellow actors—all men at the time—performed for audiences of all classes and backgrounds, with groundlings paying a penny to stand for hours (and risk being pickpocketed) and wealthier attendees observing from terraced seating above. These performances competed with bear baitings and public executions as the most popular forms of entertainment for the poor and working classes. Why is it that, with so many archaic words and obscure references, Shakespeare’s plays are still being performed today? This question is being dissected and discussed by people across Wisconsin committed to the community and creativity brought to us by one of the brightest writers in the history of the English language. 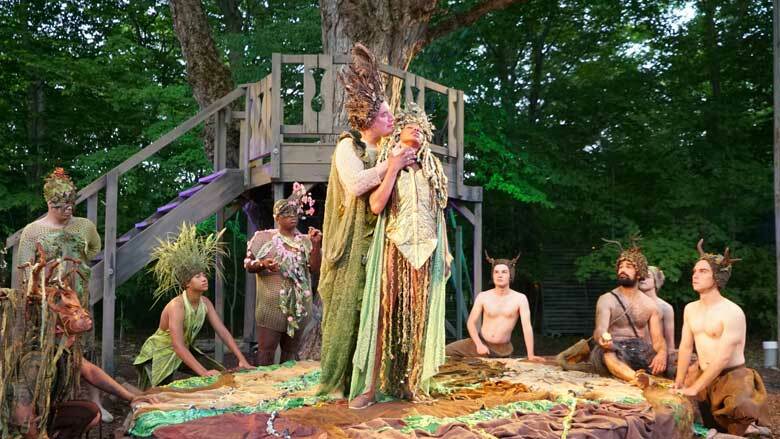 The second-largest outdoor theater in the U.S., American Players Theatre near Spring Green hosts over 100,000 people during the June through October season, which includes productions of at least two Shakespeare plays and five other plays by classic and contemporary playwrights. For their commitment to the production of classic theater, American Players Theatre was recently called “the finest classical repertory company in the U.S.” by Wall Street Journal theater critic Terry Teachout. This commitment reflects both the deft production of classic works and, since the company’s founding in 1980, a continual exploration of what constitutes a classic. With a mission of “bringing the classics to the people,” American Players Theatre in Spring Green tries to answer the question of Shakespeare’s enduring legacy every day. Artistic director Brenda DeVita, who has been with the company for more than twenty years, says that “artistry of language and exploration of universal themes” are two broad requirements for a classic. According to DeVita, American Players Theatre also seeks to promote inclusion and diversity in its productions, two elements often unexplored in the traditional theatre canon. This year, classic works by Oscar Wilde, Arthur Miller, and Tom Stoppard will play on the main stage, while provocative works by contemporary playwrights Carlyle Brown, Stephen Massicotte, and Sarah Ruhl play in the smaller Touchstone Theatre. Located down a wooded road in the rolling hills of Wisconsin’s Driftless Region near the Wisconsin River, American Players is hours away from major cities. Even the Up-The-Hill main stage is a quarter-mile walk from the parking lot and picnic area along a winding path that takes theater-goers through a small portion of the 110-acre property lovingly maintained by staff and volunteers. The American Players team thinks the rural Wisconsin environment is central to what they do: “Play in the Woods.” Company member David Daniel compares the uphill hike to theater-going in classical Greece and Rome, where theaters were removed from the city, usually on a hillside, and all audience members had to walk together on a shared path. Daniel says this shared experience helps to strip away the divisions of the real world and brings people together as a community before they even see the play. Much more accessible, The Comedy of Errors captures a different side of Shakespeare. What seems to be a familiar farce based on mistaken identity—two sets of identical twins separated at birth inadvertently switch places and shenanigans ensue—is actually a droll musing on the complexity of daily life. For this summer’s production, director David Frank (former American Players artistic director and current Wisconsin Academy Fellow) is tweaking things a bit by casting one set of twins as female in the hopes of adding to the mayhem. The bawdy broadness of Comedy is a fine reminder of how Shakespeare’s work can please a diverse audience on multiple levels. Young Shakespeare Players was founded in Madison in 1980 with a simple idea: anyone of any age can connect with Shakespeare. For 36 years under the direction of Richard and Anne DiPrima, Young Shakespeare Players has been producing uncut Shakespeare plays with actors ranging in age from 7 to 18. Instilled with an early love of Shakespeare’s words by his mother, Richard DiPrima has been exploring and sharing the Bard’s plays through individual scholarship and community-level performance his entire life. He firmly believes that traditional educational systems don’t challenge children in a meaningful way. With a regular repertoire of twenty Shakespeare plays ranging from the familiar A Midsummer Night’s Dream to the obscure Cymbeline, as well as two stage adaptations of Charles Dickens novels and a dozen or so one-act plays by George Bernard Shaw, the Young Shakespeare Players stage is bustling all year round. Each production features multiple casts, allowing every actor the opportunity to perform a significant amount. Equal opportunity to experience Shakespeare is one of the key values at Young Shakespeare Players; auditions are not to determine who will perform and who will not, but to decide which role or combination of roles to which each actor is best suited. Actors are expected to memorize their lines and also understand the meaning behind the words. Despite the density of Shakespearean text, filled with puns and archaic references and words, there is some quintessentially human element that runs through these plays: his grasp of humor, pathos, double entendre, allusion, and metaphor all reflect a deep understanding of human character. This is what the actors feel when performing on stage. If they are successful, the audience feels it, too. “[People ask], How could one person think of all that when writing it? and our answer has always been the same. If Shakespeare thought of it all consciously before he wrote these words, he was a great genius. If he wrote them and did not think of them all in advance, he was a greater genius still,” says DiPrima, who has written multiple books on the language of Shakespeare. While DiPrima continues to guide the vision and artistic tone for Young Shakespeare Players, former actors produce and direct the shows. Michael Fleischman and Katherine Johnson, two of the directors this summer, began acting in the company when they were eight and nine years old. In their early twenties now, Fleischman and Johnson are sharing what they’ve learned over the last decade—about Shakespeare, acting, humanity—with the next generation of Young Shakespeare Players. When it comes to working with young people, “generations” are very short, three or four years. The novice-to-instructor transition that many actors make after working with the Young Shakespeare Players reflects a mentorship cycle that plays out across many of the performing arts. This relationship is beneficial not just for those learning but for those teaching, giving people in their teens and twenties the space to consider their own knowledge and share it in a meaningful way. And at Young Shakespeare Players, these mentors are passing down a love of language and a shared human experience. So begins Door Shakespeare’s production of A Midsummer Night’s Dream. While Door Shakespeare produces only two plays during their summer season (this year the other is Julius Ceasar), they do them every night on an outdoor stage at the 405-acre Björklunden estate just south of Baileys Harbor on the shores of Lake Michigan. Door Shakespeare started as a project of American Folklore Theater (now Northern Sky Theater) in 1995. Realizing a potential to reach many more people with the Bard’s plays, the American Folklore Theater board decided to make the project an independent entity in 1999. Although there was already a colorful diversity in the Door County theater scene at the time, “there was this really great niche and place for classical theater,” notes Door Shakespeare executive producer Amy Ludwigsen. A former artistic director of the Milwaukee Repertory Theater (1993–2010) and veteran actor, Hanreddy emphasizes the humanity of Bottom and the Mechanicals, craftsmen who remind him of the blue-collar workers of Door County and Wisconsin. In Hanreddy’s empathetic treatment, the Mechanicals become respectable and recognizable, something more than just slapstick comic relief. Ludwigsen and her fellow company members are committed to “opening people’s perceptions to what Shakespeare’s theater originally was—the atmosphere, the environment—and how that relates and is still relevant to us today.” Door Shakespeare works especially hard to connect with kids, providing free tickets to them during the summer and working with area teachers to ensure plays are discussed in classes during the fall. During the summer the company also offers Doorways, a theater program for children. Doorways provides children ages 7 to 17 the opportunity to work with the professional actors in the company and learn about ensemble work, practice stage combat, and delve deeper into Shakespeare’s works. Many of the professional actors who comprise Door Shakespeare and today teach for the program got their start through Doorways. Ludwigsen credits the popularity and longevity of Shakespeare to his ability to humanize timeless ideas and themes: greed, love, desire, folly, ambition—often all in one play. Compare the plot of Julius Caesar to contemporary politics and the “anguish, conspiracy, and [lust for] political gain are all still totally relevant [today],” she says. We have Shakespeare’s friends and colleagues in the King’s Men to thank for safeguarding his work for future generations. Produced seven years after Shakespeare’s death by colleagues John Heminge and Henry Condell, the 1623 First Folio contains 36 of Shakespeare’s plays, including 18 that had never been printed before, and features the now-famous portrait of Shakespeare by Martin Droeshout. A folio is a large book in which printed sheets are folded in half only once, creating two double-sided leaves, or four pages; it was an expensive production. Even so, there must have been an incredible demand for Shakespeare folios at the time. With only 235 of these First Folios in existence today, 82 of which are held by the Folger Shakespeare Library of Washington DC, they are rare treasures for those who seek to connect with the history of the Bard. To commemorate the four hundredth anniversary of his death, the Folger Shakespeare is sharing original First Folios of his work with all fifty states. A First Folio edition of Shakespeare’s complete works will be exhibited at the Chazen Museum of Art in Madison during November 2016. Working with the Folger Shakespeare Library, University of Wisconsin–Madison Libraries are highlighting numerous educational and performance opportunities through their website to go along with the exhibit at the Chazen. Through a broader initiative called Shakespeare in Wisconsin, UW–Madison will present other Shakespeare-related artifacts from their Special Collections Library during the First Folio visit as well. One of Marty’s recent Shakespeare-related endeavors took her across print to stage to the Web through a popular MOOC (massive online open course) entitled Shakespeare in Community that explored the theme of community in his work and discussed how Shakespeare touches many different kinds of people. The course, which will return in fall 2016, had over 22,000 participants from over 160 countries during its spring 2015 run. When developing the MOOC, a guiding philosophy for Marty and partner Jesse Stommel (assistant professor of digital humanities at UW–Madison) was that you didn’t need to be an expert in literature or history to be part of the online conversation. Eschewing the traditional lecture format, Marty and Stommel created videos of Wisconsin Shakespeare lovers (including performers and production members of American Players Theatre and the Young Shakespeare Players) sharing their own opinions on and knowledge about Shakespeare. They paired these videos with discussion boards where MOOC participants could both respond to the content and share insights and opinions with each other. Marty sought the help of UW–Madison associate professor of English Josh Calhoun in creating a real-life experience to complement the immersive atmosphere of the MOOC. The two partnered with UW–Madison’s Department of Continuing Studies to create a “Shakespearience Weekend” full of workshops, talks, tours, and shows at American Players Theatre for people who want to watch, discuss, and share Shakespeare’s work. Like the MOOC, the Shakespearience Weekend program has been renewed for the fall of 2016. When asked what makes this 450-year-old playwright so special, Marty says that “it’s Shakespeare’s ability to show us humanity. Whether it’s goodness or it’s evil or just messy complexity … his talent as a writer is that he’s showing a range of ages, a range of experiences, a range of characters.” She attributes her compulsion to share Shakespeare with others to “a love of learning, a love of language, [and] a love of story”—all things, Marty notes, that Shakespeare captures in his work. People such as Marty, Ludwigsen, DaVita, and the DiPrimas spend their lives trying to pinpoint what it is about Shakespeare and his work that makes him such a massive influence and continued presence in our society. It’s a question everyone can ask, and everyone can answer in their own way. As we remember the plays of the Bard, we must also remember that one of the most foundational components of theater is community. Thanks to Shakespeare, actors and audience alike can transcend barriers of space, time, and difference to join for a few moments of shared experience and human understanding. UWM's Anne Basting Named MacArthur "Genius"